With delectable dishes like Crispy Pancake Rolls and Thai Curry with Tofu you can create tasty snacks as well as delicious meals, both for the everyday and entertaining guests. 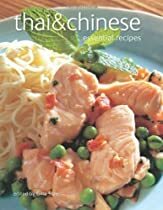 Including an invaluable discussion of typical fresh, dry, canned and preserved ingredients, “Thai & Chinese” then details a wide variety of recipes from soups and starters to main meals. Traditional dishes such as Szechuan Beef are provided alongside exotic suggestions such as Fragrant Thai Swordfish. Clear step-by-step photography and text will allow for a quick and easy cooking experience.